There are basically two tax systems in this country and they are not for the rich and everyone else. They are: one for the self employed business owner, (1099), Schedule C, (see Addendum, page 47) and one for the employed worker, (W-2), Schedule A. As you just learned, the self employed direct sales/affiliate marketing business owner enjoys tax savings that are simply not available to the employed worker (see Glossary, page 42). In the 1800’s approximately 80% of Americans had their own businesses. In the 1900’s, after the industrial age, approximately 80% of Americans became employed workers. In the 2000’s the tide is shifting back to the business owner. If you are currently not happy with your current financial state, a direct sales/affiliate marketing business opportunity is the #1, absolute best chance for the average American to make a significant positive financial change in their life and take control of their future. And the best part is Uncle Sam is going to pay you to build your business. How? Through the tax savings! The next section of this book consists of chapters with different tax savings strategies and techniques. I suggest that you lend this book to a friend. It could be a very valuable prospecting tool. And the best part is, this book is tax deductible! Let’s make sure that you really understand much of what you are already spending personally can be reclassified as legitimate deductible business expenses. For example: you and your family have scheduled in your appointment book one to two weeks out of town, in another state, to attend a family wedding. While you are there, you are going to visit friends & family and see the sites. What will you be spending? Airfare, hotel, car rental, gas, restaurants, entertainment, etc. This could easily add up to $3,000! If you are a W-2 employee, without a business, these are personal non-deductible expenses. However, prior to going on this trip, you contract with a direct sales/affiliate marketing company for your own home based business. Now your intent is not going on a personal family trip, your intent is now to share with everyone you meet, your awesome products and opportunity. Prior to going out of town, you call your friends & family and schedule get togethers to share your product and/or opportunity. You bring sample products and promotional tools to share with your friends & family who are now prospects for your business. You keep track of your customers and/or business meetings and expenses in your appointment book. You, your spouse and children over age 6, are all involved in this family business. You have just converted that $3,000 personal expense into a $3,000 legitimate deductible business expense, saving for you approximately $1,000 in taxes. Wow! Please consult with your tax adviser/preparer for the specifics on how to do this. 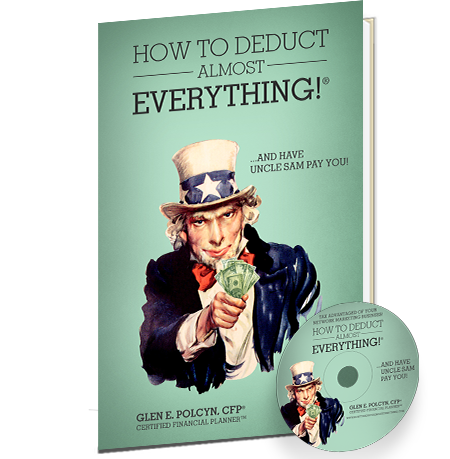 Get Your Copy of How To Deduct Almost Everything Now! It is not how much money you make, it's how much money you make and keep. Get your copy to learn more!! There are two tax systems in the United States? One for the Self Employed, Schedule C, and one for the Employed, Schedule A? If your Self Employed business expenses exceed your Self Employed Income, your net loss can be deducted against your W-2 earnings if you are employed with a job? You can hire your children, ages 7 – 17, and deduct the income you pay them? You can put next years Conference Expenses on your charge card in the current year, actually pay for it next year, and still get the tax deduction for the current year!? Gifts are tax-deductible if they are promotional products of your Self Employed Business? The more you prepare and think about taxes today, the less you’ll have to pay come April 15th!? This book is awesome! I like how you encouraged people to consider a direct sales/affiliate marketing business for tax purposes, but to stay on auto-ship too. This book is fantastic! Straightforward, motivating, informational. Congrats! Glen, I have to say that your book is the bomb! Most people have no idea about all the tax advantages that you so eloquently simplify for those involved in our industry. Thank you for taking the time to help so many! For more Reviews, click on the Reviews tab above. President and CEO of B & G Financial Services has been a CERTIFIED FINANCIAL PLANNER™ practitioner for almost 30 years. 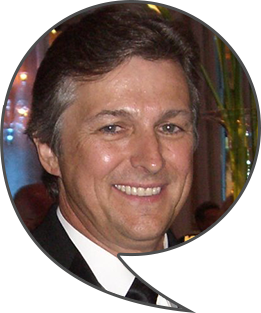 Glen specializes in income, investment, and retirement planning, as well as estate, succession and tax reduction planning for a clientele of affluent individuals, retirees, successful professionals and small business owners. Glen and his wife Becki have been in the direct sales/affiliate marketing business since 1986. In addition to each having a very successful financial services practice, they have built a very successful third business, their home based direct sales/affiliate marketing business! Join our Newsletter for Tax Saving Tips!